Is it a a pain to try and teach your students about the "central idea" of a text. THEN STOP HERE AND LOOK :). 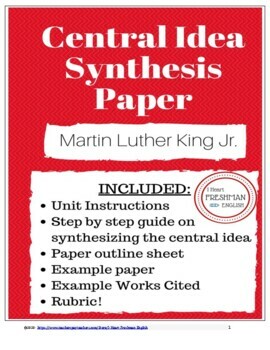 This unit is used to help my students learn how to coherently articulate the central idea of two texts and write it into a synthesis paper by using "I Have a Dream" and "I Have Been to the Mountaintop" by Martin Luther King Jr. Links to both speeches are provided in the teacher notes. This is on our state writing test in Tennessee. 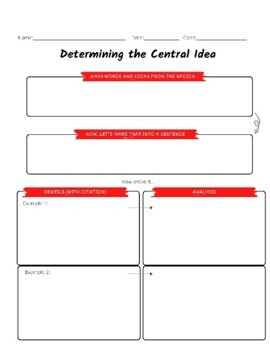 Two Graphic Organizers that help students figure out how to articulate a central idea. One organizer is for one text and the other organizer is for two. 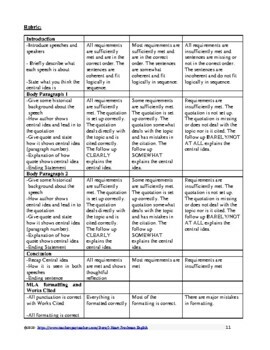 There is an outline for the paper, an example paper, and a rubric. The example paper is over the "I Have a Dream" speech from MLKJ and "Glory and Hope" by Nelson Mandela. If I don't switch it up, they like to copy. There is an example with an introduction and one body paragraph. Next is an example Works Cited Page. Next is the same example paper highlighted to show the different parts. It includes the introduction and one body paragraph. I left the point values open for you to customize it to your class. This REALLY helps my students learn how to do the central idea. Let me know if you have any questions! !